Langs Bush was originally a rectangular field within the great Middle Field of Kingston Manor. It was almost certainly a remnant of the 16th century field called Langdon's Bush. In his will dated 1655, William Daniell stated "I doe hereby give and bequeath unto my sonne George Daniell his executors administrators and assigns ymmediately after the Expiration of his apprenticeship all those my three closes called Langdons Bush which I bought of my late brother in lawe John Grubham lying in the parish of Yeovell aforesaid". In his will dated 26 February 1739 Edward Mines, Glover of Yeovil, wrote " I give to my son Richard my close in Yeovil Langs Bush". 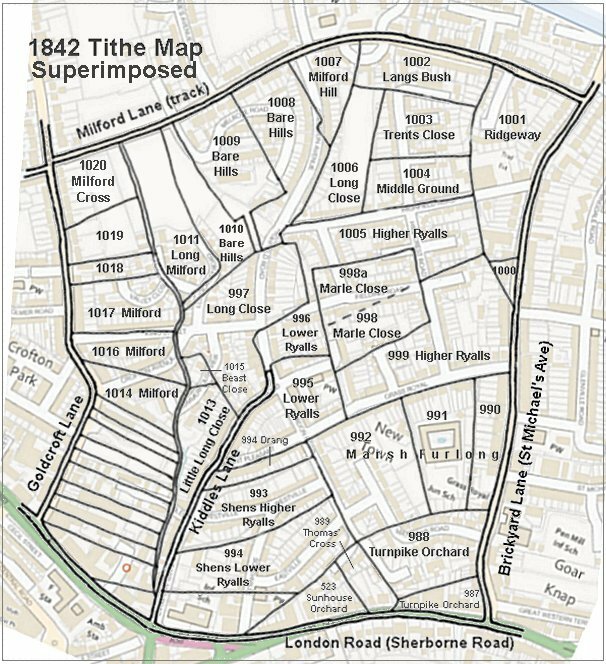 By the time of the 1842 Tithe Map it had been allocated the Parcel Number 1002. The 1846 Tithe Apportionment noted that the owner was William Davis and the tenant was the brewer of Hendford, Edmund Henning. 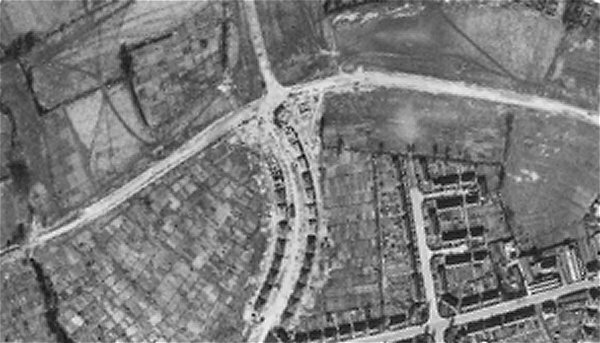 It was used as pasture (and, from the aerial photograph below, it was still being used as pasture in 1946) and its measurement was noted as 3a 1r 30p. It was bounded on the north by Milford Lane (today's Milford Road) which was originally simply a field access track. 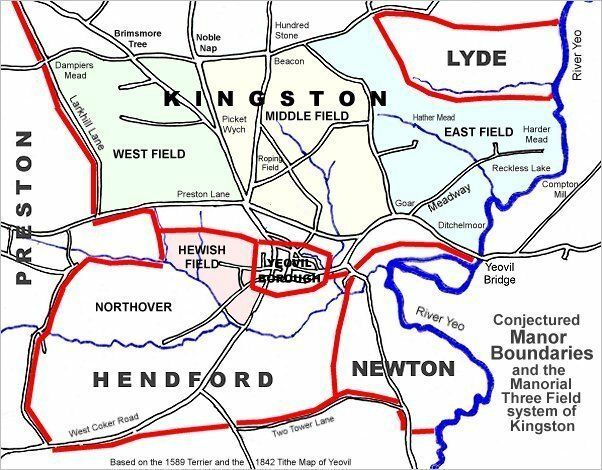 On its western side it was bounded by the fields called Milford Hill (1007), to the east by Ridgeway (1001) and to the south by Long Close (1006) and Trent's Close (1003). Today, the northern part of former Langs Bush is the site of housing on the southern side of Milford Road and the southern part is the site of Hillcrest Close. The former Milford Inn is located where the western side of Langs Bush would have been. 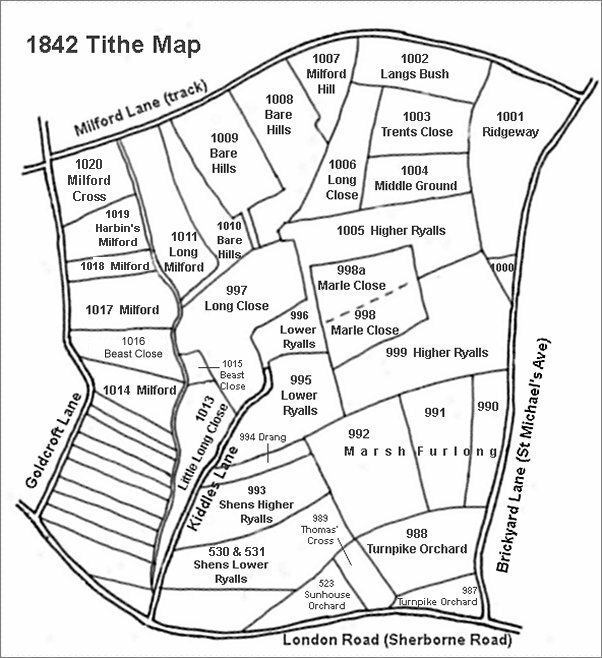 This map is based on the 1842 Tithe Map with field names added from the 1846 Tithe Award. The 1842 Tithe Map superimposed (roughly) over a modern street map showing where several modern roads, for example Gordon Road, Grass Royal and Highfield Road, follow former field boundaries. The 1946 aerial photograph clearly shows Langs Bush as a rectangular field at top right, to the south of Milford Road (running across the photograph) and bounded by hedges on three sides with the shadows of seven trees in the southern hedge. It is bounded at right by the remnants of Ridgeway (Parcel 1001). At centre is newly-built Chelston Avenue. The ragged dark line running from Milford Lane at bottom left are trees marking the route of Milford Brook.